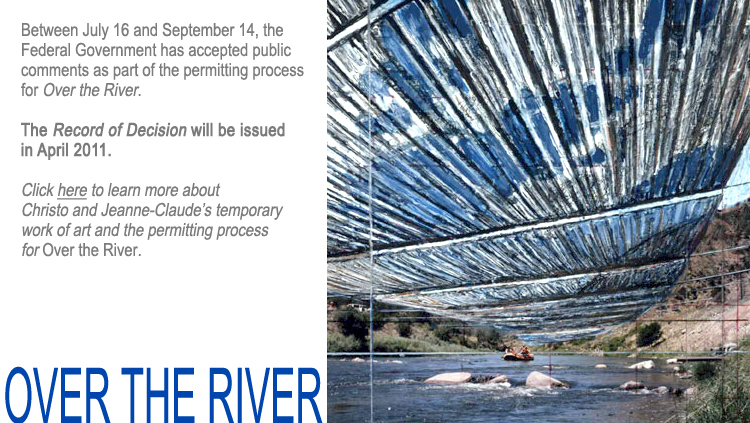 Christo plans to suspend 5.9 miles of silvery, luminous fabric panels high above the Arkansas River along a 42-mile stretch of the river between Salida and Cañon City in south-central Colorado. From Christo’s explanations and explicit drawings of what is envisioned, I anticipate certain surprises, among them a welcome revision of the river’s deportment in three-dimensional space. A river tends to be seen and thought of along the horizontality of its stream—a level course which Christo’s parallel canopy seems to confirm. But that canopy—pitched only 8 feet above the water’s surface—is to be of a transparent cloth that keeps sky and cloud always in evidence, and with it (I hope) a sharpened awareness of living under pillars of air. To say nothing of the river’s own depth in unceasing play. In other words, I expect Over the River—more precisely the low thatch overhead—to impart a livelier sense of the river’s participation in verticality. Verket är tänkt att visas under endast två veckor 2014, om tillstånd ges. Konventionella människor i Colorado försöker stoppa detta mästerverk. Jag hoppas innerligt att de misslyckas därmed. Second that. Det vore nog en upplevelse att se verket från floden, men jag kan inte påstå att jag förstår det.